To put it generally, many among those who hate the Arabs or the African immigrants do not hate them (as) much for the religion they profess or the colour of their skin, but rather because they are believed to represent the poorer segments of society. Because they live in the unfashionable "ghettos" they are assigned to by the force of their poverty. Because they represent a social misery we are ashamed of, that we rather would prefer to ignore, or has been repressed in our consciousness. Society, as well as the individuals that compose it, also have a consciousness. And this social consciousness is the ideological constellation of prevalent culture, prevalent morals, prevalent religious beliefs and prevalent ideology in the juridical system. In each of them we will find the spirit and profit of the rich but the absence of the oppressed and the poor. Secondly, to regard these immigrants as a miserable social class is not only unfair but an act of ignorance and contempt towards an important (and numerous) segment of the Swedish population and which represents a creative, enormous and dignifying social potential for the moral and economic prosperity of this country. 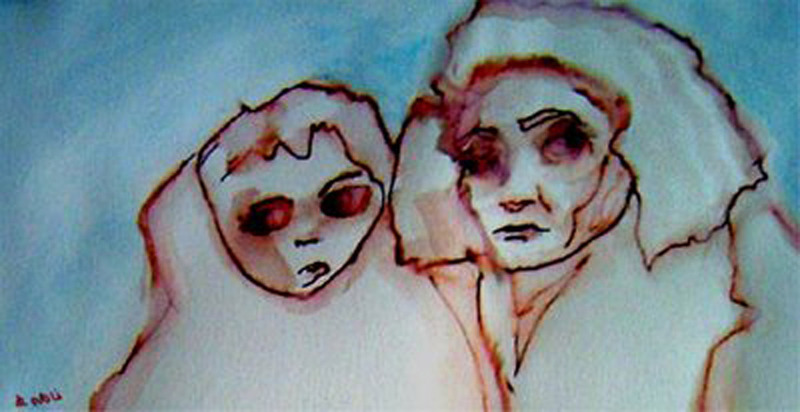 Cultural racism is the ideological position that in proclaiming limitations regarding the human rights of the immigrant population; or in describing immigrant cohorts as threatening the host society and its norms, bases such claims a) partly on the cultural characteristics of the immigrants and their social behaviour - generally assessed as less worthy, negative, inappropriate or not desirable - and b) partly on a purported supremacist culture of their own. On the other hand, cultural racism is in fact a deception covering a biological racial position, a deep racist feeling, or ethnic prejudices against selected national groups. Thus, cultural racism is the manifestation of an intentional political fraud of its proponents or the product of a sub-conscious affective state. I.e. the cultural racist will not or cannot acknowledge his real ethnic racism. My point with the factual illustration in the text given in the precedent post is - so far - that the argumentation related to foreign-status (i.e. foreign-born individuals as such) as the main criteria to oppose migration or improve the conditions of the immigrant population of Sweden is NOT tenable. 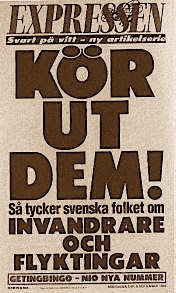 Behind pseudo argumentations of foreign-status versus "the real meaning in being Swedish" and different cultural related issues (such as "manners", dress-code and others of the like) there are real determinants at stake which have not been yet clearly identified, possibly not even by the so called "ethnic-racists" or the "cultural-racists" themselves. With this said, I do not dispute that the followers of the different emerging aggrupations within the Swedish far-right know and have clear ideas what changes they would like society to implement on behalf of their ideology. They also have their argumentation on why they want those changes. What I say is that it is not clear why they want those changes. Again, I am not referring to the reasons or arguments given for the proposed changes. My query refers instead partly to the motivational and ideological issues at an individual level, and partly to the social-psychological factors underneath the apparently growing cultural racism in Sweden. In other words one relevant issue in this debate would be to inquire into the psychological mechanisms moving individuals to such positions, and moving “the silent majority” following them, inside and outside the established political system, parties, etc, to adopt these clearly irrational or logical-incongruent positions. They might have been presented in the media as naive, and also the media have unjustifiably tried to ridicule them. But they are for that part convinced individuals and in the path of convincing others. One main contention in my theses about this kind of cross-cultural conflict, now represented in the political agenda due to the re-emergencence in Sweden of the far-right, is that one of the social-psychological mechanisms may be one of Alienation. Alienation in the psychological level of men leads to alienated social behaviour and then to ideological conceptions that would intellectually legitimize it. In its turn, what is alienated is in the first place is the ideological premises prevalent in the society, ruling in a given society in a given period. Yet, there may be other psychosocial mechanisms behind processes considered as political. This is the case of the conceptions around "trends", "popular", or "fashion" in political views. This aspect was also demonstrated in the illustration presented in my precedent post (which actually happened in reality precisely as related). This happens when "common people" in a given society, by first attributing superior economic values to another society they perceive as "stronger" (the model), ends by copycating or imitateing social behaviours and cultural behaviours they identify as characteristics of the model society. In fact the above is also a "cultural" process subjected to manipulation. They, the commons, in the end consume the culture and the values decided by the establishment according to their own strategies of international alliances in benefit of their political (and economic) interest. This would entail the cooperation in economic, military, geopolitical, and other levels. In concrete terms, the machinery appointed by the establishment, by those in the cultural power, implements the “ideologization” task. That is why they are there. One clear illustration is given by the current attitudes of "the public" against immigrants of Arab origin and Muslims. We cover this as a religious, or cultural, or political or whatever matter, inclusive "a matter of taste". In fact those who regard them as undesirable do so because they have been culturally educated in the last twenty years or so (in fact, since the first oil-motivated USA invasion in Irk, early nineties) to associate these people with terrorism, jihad, "anti Western" militant behaviour, or whatever undesirable attribute. The political points that nowadays the emergent far-right is scoring in Sweden are a consequence of this psychosocial manipulation with the public at large resulted of the political and military alliances between the Swedish establishment and NATO. In this same context NATO's foes and allies, where the allegations of "anti zionist" behaviours in Sweden - in the aftermath of an anti Israel demonstration in Malmo - should be analyzed. The debate has been prompted by the pro Israel lobby in Sweden and has been commented on in the Swedish blogosphere. It can sound farfetched that issues of "pure culture" or our "own ideas" can be traced to such mechanical issues of economic and political interests of the elites of power at a macro level, and at an international level. Yet it is the truth, the covered truth. Further, what is fashionable, what is prevalenty popular, even what is art, etc, has cultural anthropology already explained in terms of socioeconomic determinants related to our conceptions or ideations (ideations as in föreställlningar, not the same than ideology) about power, supremacy, social leadership, etc. This can very well explain the non-critical support among the population and its representatives to strategically political initiatives – from the current and past government – as the one to dissemble Sweden’s traditional foreign policy (neutrality and self determination) to assist NATO and “big power” in wars of occupation abroad. A third aspect I intend to introduce in this debate is the consideration anew of the criteria of social class, moral and social values related to the class society, as paramount in explaining the phenomenon under debate: the emergent cultural racism in the Swedish society. Pseudo notions such as ethnicity being the main explanation for this are as I said, not tenable. I mean, plainly, those who hate the Arabs or Africans do not hate them much for their religion or their skin, but because they are believed to represent the poor segments of society. They represent the reality that we would rather repress at conscious level. Society, as well as the individuals that compose it, also has a consciousness. It is the ideological constellation of prevalent culture, prevalent moral, prevalent religious believers and prevalent ideology in the juridical system. And it is easy to hypothesize associations - and score populistic points on that basis - between poverty and criminality, as it is stated they share the same habitat, the same community, or the same school. Sweden IS a class society. Economically, socially, and culturally. No doubt about this. Immigrants are defined in one of that class system. The poor, the working class in the heaviest segments of labour, the miserable. In a class society – exactly like in the cast system of the old Brahmanism India times – no one would regard as desirable, or even permissible in many sectors, to elevate these miserable, “uncultivated”, the plebe in other words, to the category of full adequate citizens. No matter how good they would behave. The door remains closed. Period. Even as a thinking, rational person it is hard for me to not be racist. I have good friends who are not ethnic swedes, although, none who are not of the same social status. I am ashamed to say so but when you see the actual physical effect of immigration it is hard to rationalize why we do it. I have freinds who have been stabbed, molested and generally abused by people who come to this country for help. When 9/11 happend, many of the ethnic arabs cheerd in school. Last week, I read, not for the first time - an article about a group of young males who kidnapped and gangraped girls aged 12 and up. All but one who had just recently arrived in sweden seeking refuge. I refuse to be racist, but it is hard. Many would regard me as a racist, based on the simple fact that I oppose mass immigration! I think racism is stupid! No more, no less! I can find no basis for whites being genetically supreme! Its all cultural! Thats my view! Nazism is cultural as is islam! They are both antidemocratic! We should disregard all antidemokratic ideologies and thats why Im against muslim mass immigration. As I would oppose mass immigration of nazis! But I welcome christians from ie arab nations! No problems with their ideology! Sure, there are racists but most Sverigedemokrater are not! And most people opposing mass immigration are not! Isnt our concern for democracy good enough?